Chicago's 2018 gay pride parade and festival weekend. 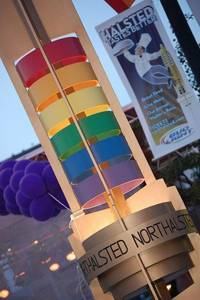 Tips, travel maps, Pridefest, parade route and information for Chicago's 48th LGBT Pride Parade. This photo mosaic contains over 10,000 photos of Chicago's Pride Parade over the last decade. Map, parade route information and need-to-knows about the Pride Parade and PrideFest weekend in Chicago. The 2018 Grand Marshal will be announced soon. Tips, tricks and pearls of wisdom for surviving the weekend and ensuring a fun, happy and safe stay in Chicago. Special offers and discounts on hotel rooms, dining options and events too! Get a list of events from around the city during Pride weekend. Plan your to-do list and map it all out right here. Links to parade entry information and the official Chicago Pride Parade website. Read exclusive interviews with past Chicago Parade grand marshals and participants. Plan your route, airport directions, car rentals or find a hotel room in Chicago. Grab a package discount with featured rooms from our travel partners. View photos from the previous Chicago Pride Parade and PrideFest weekend events. View a listing of Pride celebrations from around the world.